It was the last night of our European vacation, and we were in Brussels for less than 24 hours. We took a family stroll around the Grand-Place, and once the girls had been nourished by bland cheap pizza slices, they announced they had no intention of hanging around with Carla and I as we sat around enjoying some Belgian beers on the last night of our trip. That turned out to be a good thing: with the girls in tow we probably would have just hunkered down at someplace like the Delirium Café in one of the crowded alleys off the main square. Instead, we dumped them off at the hotel, and wandered over to the stellar beer bar Moeder Lambic Fontainas, around the corner from the famous statue of the little peeing boy. It's just off a fairly busy boulevard, but separated from it by the sleepy Fontainas square. The interior was rustic and comforting, but since the weather was finally beautiful for the last day of our trip, we sat outside on the airy patio with most of the other patrons. As you might have guessed by the name, Moeder Lambic has quite a selection of sour Belgian ales in the Lambic and Gueze categories. 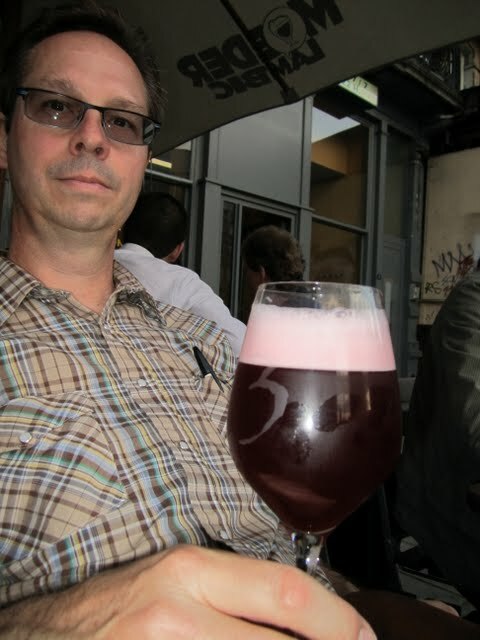 I'm far from expert in those kinds of beers, so it seemed novel and exciting to see on the menu that not only do they have a fair number of those wild ales on tap, they also have several of them served on cask, like the Drie Fonteinen Kriek in the picture here. If you know what you're after, the bottle list evidently has a lot of good choices also. A party of serious gueze lovers at the next table from us had a couple of vintage bottles brought out in wicker baskets. Even if you aren't attracted by the sour selection, there are plenty of taps of other Belgian styles, plus 15 rotating guest taps. When we were there, the guest taps included a hefeweizen, a rauchbier, and a pilsner all from Germany, a Dutch tripel, an Italian cask ale, and even something from France. Carla doesn't care for most Belgian beer, and certainly not sour beer, but she lived happily off the rotating taps, first with a Viven Imperial IPA, and then with a Mikkeller Citra single-hop. Viven is an impressive brewery -- we had really liked the porter when we tried it at Cambrinus in Brugge, and the IIPA was very solid, leaving Carla a little disappointed in her Mikkeller. Service was very friendly; our waitress replied smoothly to Carla's English, the Flemish of our gueze-drinking neighbors, and my rusty French. A small bowl of roasted barley appeared on the table as something to crunch on as we drank our beer, but we also ordered a salad and a cheese plate from the menu, and both were excellent and reasonably priced. Decent portions: I'm usually a clean plate guy, but I had to leave some cheese behind. There is obviously a lot more going on in Brussels than just this one place. I had been hoping to get there early enough to take the fabled self-guided tour of Cantillon, but it didn't work out that way. 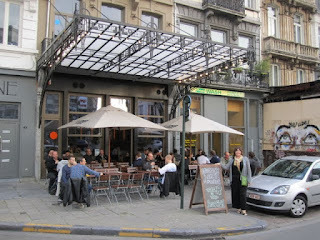 There is another, older Moeder Lambic location, but the Beer Advocate reviews seem to favor the Fontainas location we went to. I recommend it, especially if you're a sour ale fan, but even if you're not.